What can we learn from warfare in the 20th century? This book looks at the strategy, the campaigns, the tactics, the people and the technology. The 20th Century was hugely violent. It was possibly the most violent century in history. It is a clearly defined period in the past. A huge amount has been written about war, and warfare, in that period. So, what can we learn from war, and warfare, in the 20th century? War is hugely important. War shapes continents, and can do so dramatically quickly. After just 52 months of the First World War, four empires had ceased to exist. Eight new countries were born in Europe. As a result of the six years of the Second World War, Japan and Germany renounced militarism and ceased to be major players on the world stage for decades. The border of Russia moved 800km west, to the Oder. War is hugely important. It is not futile, although it appears so to some of those involved. But how effective, for example, was the allied Combined Bomber Offensive in the defeat of Germany in the Second World War? There is, in practice, no real consensus. Similarly there is very little discussion, and apparently no agreement, as to how the western allies defeated Germany in north west Europe in 1944-5. Was it just superior numbers? (No: there were more German than Allied divisions until January 1945.) Yet both of those campaigns took place over 70 years ago. Why are those questions unanswered? 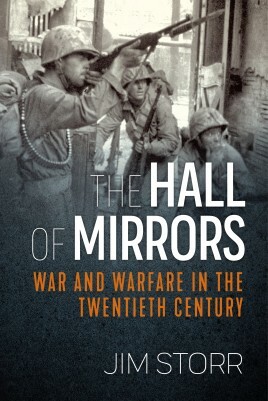 ‘The Hall of Mirrors is not a narrative history. It takes a deep look at war, and warfare, in the 20th Century. It looks at the strategy, the operational art, and the tactics. It looks at how technology developed, was developed, and affected military events. It looks at the human beings, the human organizations, and how they affected events. It makes judgments and comes to conclusions. By 1919 the First World War was already over. Those millions had died; those empires had crumbled; those new nations had been born. Nothing similar has happened, thus far, in this century. All the more reason to look back and consider what did happen, and what we might learn from war and warfare in the 20th century. Jim Storr wrote high-level doctrine for four years as a Regular infantry officer in the British Army. He then embarked on a second career in analysis, consulting, writing and postgraduate teaching. He has lectured, spoken and taught at staff colleges around the world. His first book, ‘The Human Face of War’, has been on the reading guide at a number of them. It has been described as ‘a superb guide for how to approach the conduct of operation’; a book which ‘attacks a lot of things that military folks … take for granted’. Indeed ‘rarely has there been a book as good as this for stimulating thinking.’In a temporary change of direction, ‘King Arthur’s Wars’ then looked at how Roman Britain became Anglo-Saxon England. Yet ‘ … it contains lessons for modern commanders, and is a guide for all of us as to how to think about problems holistically and logically’, and ‘his assault on … conventional history … is unrelenting, thorough, and persuasive.’ He now brings the same approach to war and warfare in the 20th century.Jim Storr was appointed professor of war studies at the Norwegian military academy, Oslo in 2013.